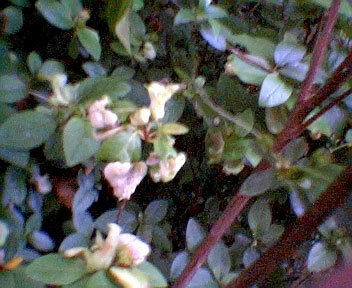 Question: My question is regarding an azalea. We have over 50 azaleas on the grounds and nobody I ask has ever seen this. Iwas hoping to be able to send a picture, because it is hard to describe. It seems to be a leaf fungus. It engulfs the leaf with a thick, green to white , succulent feeling substance. It does have the little green worms living in the cavities, they are very common up here this time of year, but it isn't the worm that is eating the leaf. 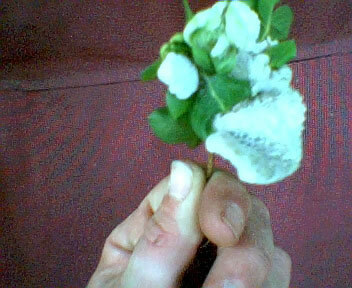 After it takes over the entire leaf, it has the appearance of the original leaf but is approximately 1/4 inch thick. 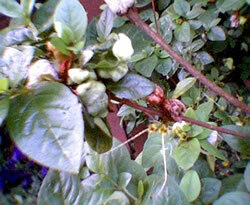 ANSWER: It looks like a common disease problem on azaleas and rhododendron - leaf gall caused by Exobasidium sp. Typically this problem rarely requires chemical control. 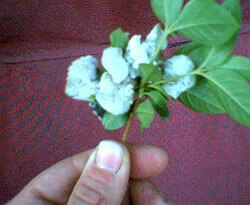 Picking off and destroying galls is the best prevention and management method. Should more drastic measure be needed, chemicals such as cooper fungicides and mancozeb, can be used as a preventative spray according to labeled instructions. Pick off the affected foliage and destroy (don't just throw on ground). Degree of symptoms vary year to year based on weather conditions in spring as young leaves are expanding. 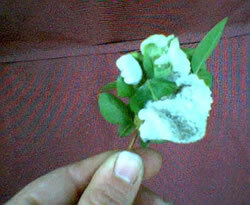 Fungicides would have to start as leaf shoots develop and expand until weather conditions turn hotter/drier.